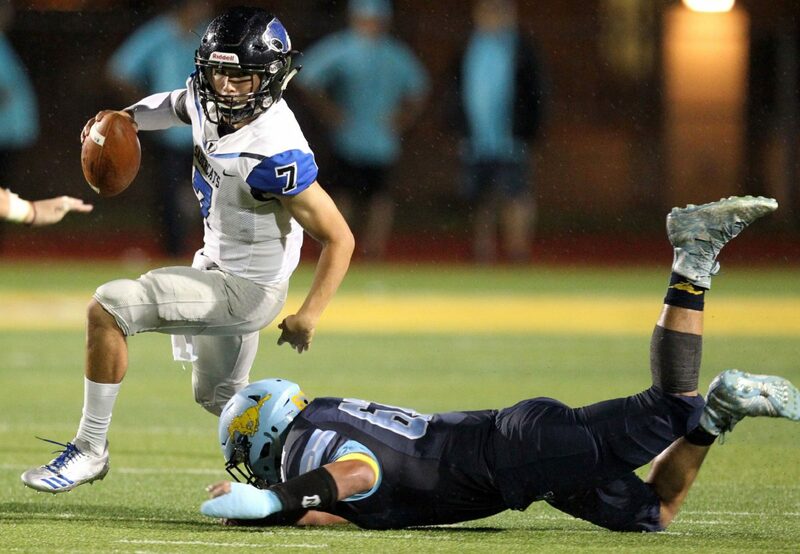 Vela Anthony Sotelo escapes the grasp of McAllen Memorial defender Axel Hernandez in the 2nd quarter at McAllen Memorial Veterans Stadium on Friday, September, 14, 2018, in McAllen . Edinburg Vela and Weslaco High have both been juggernauts through the first six weeks, coming out of the gate in furious fashion. Both teams have dismantled foe after foe, and fought their way to undefeated records. That ends Friday, as one of the two District 31-6A teams will take a loss when Edinburg Vela (6-0, 2-0) travels to Bobby Lackey Stadium in Weslaco to take on the Panthers (5-0, 1-0) at 7:30 on Friday night in The Monitor’s Game of the Week. There are mouth-watering matchups all over the field, but perhaps the most intriguing will be the battle in the trenches. Weslaco High boasts a stellar defensive front powered by seniors. Senior linebacker Marco Noriega leads a group of defenders who have been a problem for opposing offenses all year. A few other defensive stalwarts along the front are Seth Sanchez, Benito Juarez, Jesse Ramos and Roy Trevino, all seniors. And Vela’s defensive front is no joke either, with senior Sergio Carrizales, senior Brandon Beebe and junior Eddie Salinas starting on that line, and a deep, deep rotation to back them up and matchup with different scenarios. Vela takes the edge in the rushing game, with senior Christian Flores second in District 31-6A with 505 rushing yards. It is just an edge for Vela, however, as Weslaco junior quarterback Jacob Cavazos is hot on his trail with 471 rushing yards. Cavazos is a difference-maker at quarterback. He has thrown for 742 yards and 15 TDs. His passing combined with his rushing doesn’t even capture the entire story. Cavazos has not thrown an interception. He has only had one fumble on the year. His ball security is just an example of how advanced his mental game is, in just his first full season starting as a varsity quarterback. Vela hopes that AJ Sotelo can rise to the level of Cavazos or Nathan Garcia, who graduated from Vela last year, and Sotelo has made several strides in that direction, but his season as a whole has not been equally comparable. Sotelo has more passing yards (1,068) with one more game played, but he has also thrown two interceptions, fumbled twice and his completion percentage has been lower than Cavazos’ all year. The final stage of the offense is receiving, but nothing more than the words “senior Daniel Enriquez” needs to be said on that matter; no one in the Valley comes close to his level. Both teams are fundamentally sound. Both have good kickers and punters. They have great return specialists and have remained disciplined in the big moments. Expect football played at the highest level. The team that blinks first could see their 0 in the loss column go right out the door, or the gate, as it were.